Down with idiotic disclaimer footers and dumb surveys! You can put whatever legalese you please in your email footer but it won't do you any good. And your endless surveys? Stop already! The contents are not to be disclosed to anyone other than the addressee. Unauthorised recipients must preserve this confidentiality and should please advise the sender immediately of any error in transmission. Pretty personal, eh? The survey was triggered by my recent and very disappointing stay at the DoubleTree Club by Hilton Orange County Airport. I posted my review to Yelp but unlike other reviews I’ve written, neither Hilton nor Expedia has made any attempt to address my concerns. 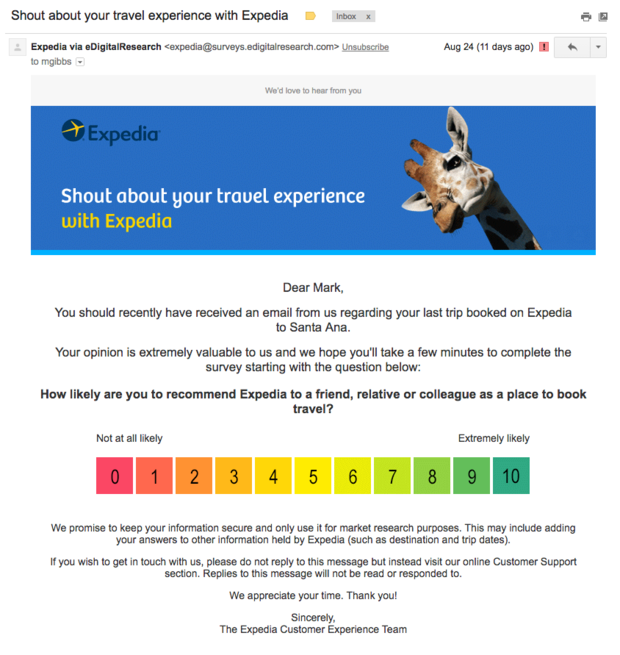 What was even more annoying about this survey from Expedia was that days before, minutes after check-in at the hotel, they'd sent me another survey by email! As with the majority of these surveys, there’s no benefit whatsoever to the person being surveyed even when it provides the opportunity to complain because you are hugely unlikely to ever get any response. You have to wonder why anyone ever bothers responding. Usual disclaimer: I am not a lawyer, etc. … In the short bit of research that I've done, I've yet to find a case where blather of this type led to any kind of meaningful outcome (good or bad). There might be a few cases out there, but the signal to noise ratio is extremely low. … The lawyers I know who actually get stuff done don't have this detritus in their messages. There is virtually no scholarly analysis of the impact of email disclaimers and very little analysis by non-scholars. One of the few authors who have commented on the subject suggests that the misconception that email disclaimers have validity may arise from the mistaken belief that the Electronic Communications Privacy Act (ECPA) somehow applies … But, as this author points out, the ECPA prohibits only “intercepting” emails. Emails that arrive at their destination—even if the sender did not intend that destination—are not emails that have been intercepted in transit, and the ECPA is therefore inapplicable. In short, the ECPA is focused on the criminal intent of the interceptor, not the ability of the sender to execute his or her own intentions. I’m not suggesting that everyone who uses disclaimers at the end of emails immediately run out and order the IT staff to delete them. Although rare, there are circumstances where “everybody does it” is as good a reason to do something as any. Email disclaimers cost nothing, and you certainly won’t be in the minority if you use them. E-mail disclaimers … are mostly, legally speaking, pointless. Lawyers and experts on internet policy say no court case has ever turned on the presence or absence of such an automatic e-mail footer in America, the most litigious of rich countries. Many disclaimers are, in effect, seeking to impose a contractual obligation unilaterally, and thus are probably unenforceable. This is clear in Europe, where a directive from the European Commission tells the courts to strike out any unreasonable contractual obligation on a consumer if he has not freely negotiated it. So, as is common in many situations where the Internet runs full tilt into how we used to do business, the answer as to whether disclaimer footers are a good thing is a faint maybe, possibly, sort of yes, but, in reality, no, not at all; they're just a waste of time. As for the endless surveys every time you buy something or stay in a hotel or do pretty much anything, they’re also a total waste of everybody’s time. So, if your organization is adding disclaimer footers or sending out pointless, stupid surveys please stop it and make our lives and our email just a little less annoying. Comments? Thoughts? Connect to me or comment below then follow me on Twitter and Facebook.